Now I am the first to admit that you would be hard put to fit this wooden door into the history of a farm in Chorlton. But this is the stables of Brook Farm which dates back to at least the late 18th century and was still a farm of sorts in the 1920s. 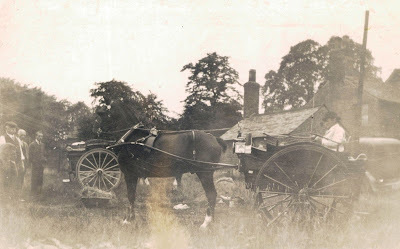 The farm stood on Brookburn Road opposite the school, and the stables was sited on what is now the playground beside the new bit of the school. I can’t be sure exactly when it was demolished but it may have lingered on into the very early 1970s finally being knocked down to make way for the school which of course means there will be people who remember it. I missed it by just a handful of years but Peter Mcloughlin has vivid memories of the stables and the farm which for a big chunk of the last two centuries was also a dairy. Peter’s father worked there for twenty or so years from the early 1920s and as you would expect amassed some fascinating pictures of the place. I had already been interested in the farm and have begun to track the tenants who ran it from Mrs Lydia Brown who was there in the 1840s, through to the Holland family and Mr and Mrs Cookson who were still there in 1911. 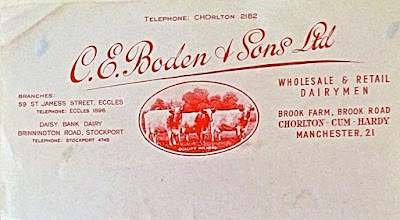 After that the chronology gets a bit hazy but by the 1920s the diary belonged to Mr Charles Boden and later became Dobson’s before becoming Express Dairies. At which point we have reached that moment in time when my own sons will be able to talk confidently of the milk yard across from their school. 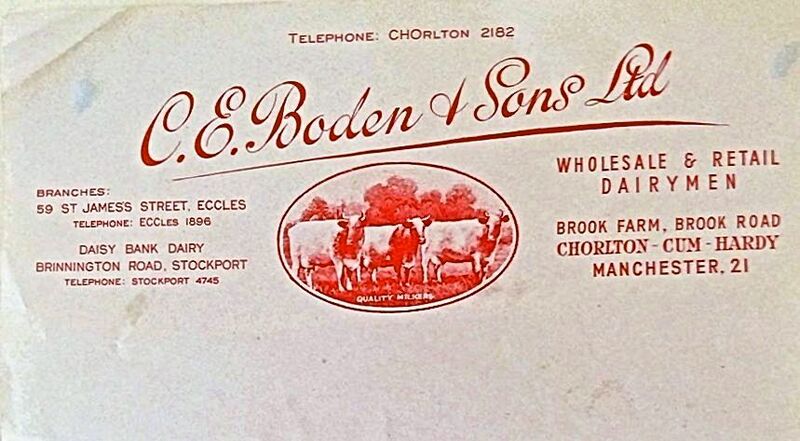 During its time under the Boden’s the business expanded to include branches in Eccles and Stockport and after the last world war Peter’s father became manager at the Daisy Bank Dairy on Brinnington Road successfully expanded the number of rounds. This is a bit of the history of the farm I knew nothing about which is all the more remarkable given that it is recent history. Bits of the farm’s story from the 19th century are fairly easily accessible, so I know how much land Mrs Brown was farming in the 1840s, where it was located and its usage. Added to that I can track the families who ran the farm for the rest of that century using the census records and street directories and it will be possible to crawl over the old rate books and get an idea of the value of the farm. And we do have the odd photograph of the farmhouse which had nine rooms making it a substantial building. 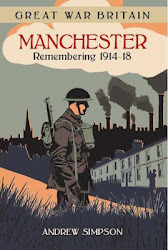 But the evidence trail for the period after 1911 is more difficult to find and so Peter’s pictures and memories are important. At which point I could become pompous and slide into a series of observations of how much of our collective past we let slip away. But I won’t, instead I shall just thank Peter, promise more stories from his collection and just make the appeal for any more photographs or stories of the farm. Which just leaves me to offer up a hostage to fortune and ponder on the building in the background of this picture of Peter's dad and Mr Boden at the farm. I think it is the rear of the Bowling Green which when our photograph was taken was still relatively new having replaced the old one which dated back to the 18th century. So there I have said it and await the comments. 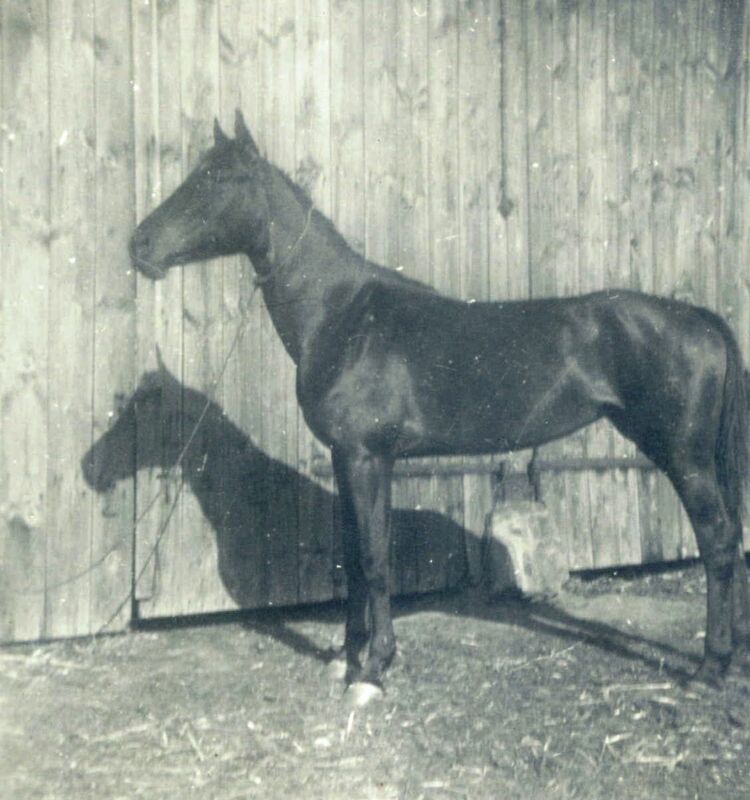 I think that horse on the first picture is a Hackney. They had high action and were considered smart as delivery animals, they are now a rare breed.